Bravecto Chew A long-lasting flea and tick treatment, Bravecto is manufactured by Merck and the active ingredient Fluralaner remains effective for a surprisingly 3 month’s period. The ingredient kills fleas and ticks by acting as an inhibitor of the arthropod nervous system. The mode of action of fluralaner is the antagonism of the ligand-gated chloride channels (gamma-aminobutyric acid (GABA)-receptor and glutamate-receptor). Available for cats (topical solution) and dogs (chew and topical solution), the treatment is suggested by many vets. K9 Advantix A unique parasitic treatment that terminates fleas, ticks, mosquitoes, flies, chewing lice and biting insects. The ingredients Imidacloprid and Permethrin present in it treat dogs by paralyzing parasites and killing them. Manufactured by Bayer, the topical solution prevents your pooch from parasite borne diseases by parasites by killing multiple parasites. Activyl Activyl is for dogs and cats both, it is a one-time monthly spot-on treatment that treats adult fleas and flea larvae hence preventing re-infestation. Manufactured by Merck Animal Health, Indoxacarb the active ingredient of topical treatment kills parasites with the process of bioactivation. The product activates indoxacarb through flea’s own enzymes. The activated ingredient then destroys fleas and larvae by hindering the nerve transmission which results in the treatment of fleas. The topical solution is apt for dogs and cats aged eight weeks and more. Simparica Simparica, a flavored chewable tablet, is manufactured by Zoetis and is outstandingly effective against fleas and ticks. The oral treatment remains effective for one month. The active ingredient, sarolaner, kills fleas and ticks by causing an uncontrolled neuromuscular activity. Effipro Duo Spot-On The effective and affordable topical solution by Virbac, Effipro Duo Spot-On kills fleas and ticks easily with the help of its active ingredients Fipronil and Pyriproxyfen. The potent combination of sterilizes adult fleas and inhibits immature flea life stages. The spot-on is available for both cats and dogs. You just have to pick the correct pack. These 6 alternatives are by far, the best in the market and can be trusted. Make sure that you contact your vet before changing the flea and tick treatment and read the package inserts carefully. 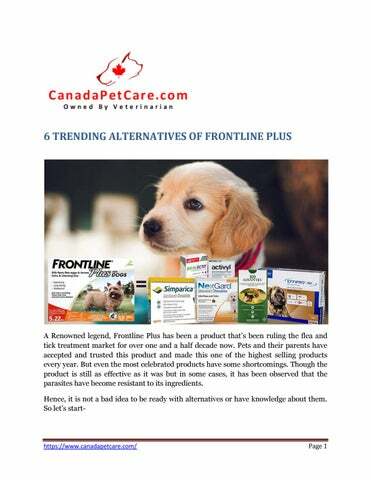 However, if you still want to use Frontline plus you can certainly use the product because the topical treatment is unequivocally the best flea and tick killer. 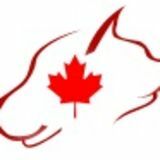 You can find all of the above products at canadapetcare.com at affordable prices. Preventing parasites is saving your pets from diseases.